Glühwein, roughly translated as “glow-wine,” from the hot irons once used for mulling, is popular in German-speaking countries and in the region of Alsace in France. It’s a traditional beverage that is offered during the Christmas holidays. The oldest documented Glühwein, circa 1420, is attributed to Count John IV of Katzenelnbogen, a German nobleman who was the first grower of Riesling grapes. Usually prepared from red wine, Glühwein is heated and spiced with cinnamon sticks, cloves, citrus, sugar and at times vanilla pods. 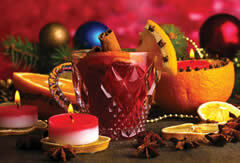 It is sometimes drunk “mit Schuss,” with a shot, which means that rum or some other liquor has been added. Fruit wines, such as blueberry wine or cherry wine, are occasionally used instead of grape wine in some parts of Germany. Mix in the red wine and carefully reheat to just under the boiling point. Garnish with lemon slice or clove spiked orange wedges and cinnamon sticks. Serve warm. And enjoy the Holiday Season!